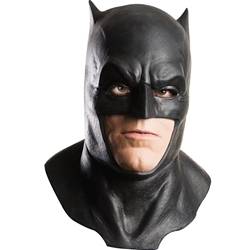 The Batman Cowl is an officially licensed Full Latex Mask with Cowl. The Cowl includes a latex lower face with jaw line and lips. The only things visible of the wearer are the wearer’s eyes. Suit up to defend Gotham with the Batman Cowl! This iconic Mask is a great finishing touch to any Batman Halloween costume. Check out our array of Batman accessories including Batarangs and Grappling Hooks. Become the hero we need this Halloween!